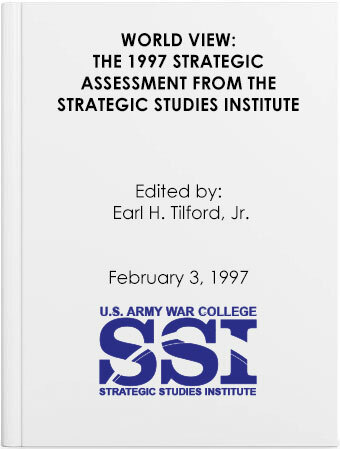 In December of each year the analysts at the Strategic Studies Institute (SSI) look to the year ahead to assess the strategic equation for their particular areas of interest. This is part of an effort to focus our priorities both corporately as well as individually. As they address those issues and factors that will affect U.S. national security strategy over the next 12-18 months, our analysts are also forced to think about the next decade. The strategic context in 1997 will be quite similar to that of 1996 in that it remains complex and uncertain. This year, however, the way we assess the world of the 21st century is even more important because the Army, along with the other services, is engaged in the congressionally-mandated Quadrennial Defense Review (QDR). Beyond the QDR, our conceptions of the future have implications not only for Force XXI and Army XXI, but also for the kind of Army that will serve the nation when Army XXI systems near obsolescence in 15-20 years. Getting the strategic context about right is important because the Army After Next, although highly capable, will also be small by comparison to those forces of only a few years past. Furthermore, decisions made in 1997 as to weapons development and force structure will emerge in the Army of 2010-2015.